The PS VR bundle will see a significant price cut beginning September 1 bringing the cost of owning a PS VR bundle and the PS4 to just US$700, making this the cheapest VR implementation one can get. Virtual Reality has not yet taken off the way one would have hoped but that is not stopping OEMs from enticing users with affordably priced VR headsets. Facebook-owned Oculus and HTC have discounted their VR offerings substantially and now it looks like its Sony's turn to play catch up. Sony has announced that it will be offering the headset and PlayStation Camera in the PS VR bundle for US$399 from September 1. 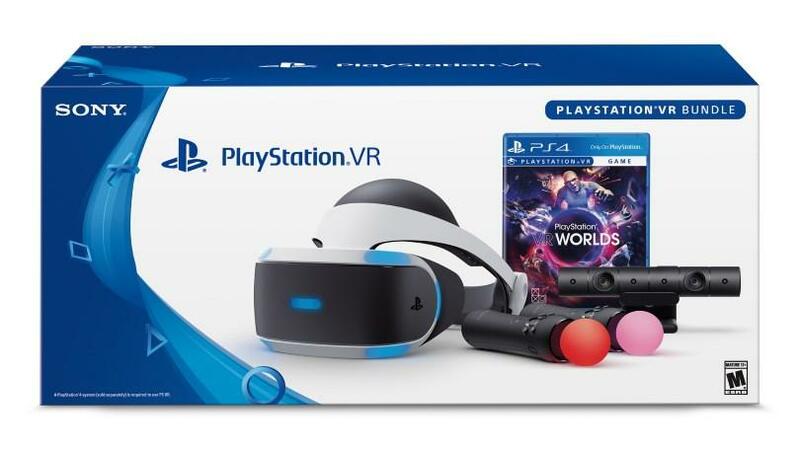 The PS VR Worlds bundle also sees a price cut to US$449 (from US$499) and that includes the two PlayStation Move controllers as well. The PlayStation VR (PS VR) has been one of the more affordable ones since its launch — partly because it just needs the PS4 or PS4 Pro to function negating the need for a more expensive high-end PC like the other two. So that brings the effective cost of owning the new PS VR bundle along with a PS4 to just US$700 and up to US$800 if you factor in a PS4 Pro. Add another US$50 if you plan to include the Move controllers as well. The PS VR has had less of a patronage in the VR market compared to the Oculus Rift or HTC Vive due to complaints of poor image quality and nausea, which could probably be attributed to the lower hardware capabilities and specifications of the PS4 Pro compared to a full fledged PC VR experience. To that effect, Sony is surveying how users are currently experiencing the PS VR and could implement some of the requested changes in version 2.0. The company says that users who opt in now will be getting access to over 100 titles including Farpoint, Batman: Arkham VR, Star Trek: Bridge Crew and more. The end of this year will also see the launch of Skyrim VR and Doom VFR, with Skyrim VR being a PS VR exclusive and Doom VFR available for both the HTC Vive and PS VR. That said, VR is still in its infancy and it will take some time for all VR platforms to mature. There's also the exclusivity factor of games to certain VR platforms. That might work for consoles where the purchase costs are cheaper but VR headsets are expensive to begin with and such exclusivity might turn out to be bad for the customer. But if you are inclined to try out the VR experience, the PS VR might be a good entry point due to its now lower initial costs.